Drag-n-drop of project objects in the project tree, which allows moving around cameras, sandboxes and entire folders making it easier to organize workspace. List of favourite plug-ins available in plug-in selection forms, which might be handy to filter plug-ins to only those which are frequently in use. Plug-ins can be added to and removed from the favourite list using their context menu. 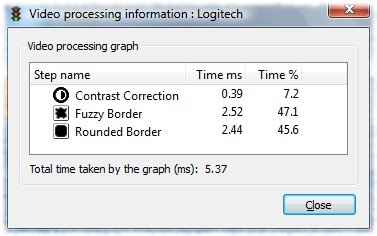 Added Video Processing Information dialog, which provides information about the average time taken by each video processing step as well as total time taken by a graph. This might be useful in troubleshooting potential performance issues and understanding how the video processing steps affect the final frame rate. Although this release is minor, the work on something bigger was going in parallel on a different branch. The planned 1.2.0 release will include scripting plug-in, which will allow writing video processing scripts allowing to achieve much more than can be done by simply adding a sequence of static image processing steps. Another interesting feature will a virtual DirectShow camera, which will allow to stream any video source from Computer Vision Sandbox application to another application like Skype, for example. And of course before getting into the virtual camera, the video could be processed with plug-ins and/or scripting. Hope to see it all in action soon!